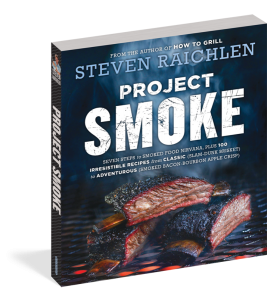 Step 1: Set up your smoker following the manufacturer’s instructions and preheat to 275 degrees. Add the wood as specified by the manufacturer. Step 2: Place the shredded chicken in a bowl. Stir in the barbecue sauce and hot sauce. Step 3: Loosely arrange 1/3 of the tortilla chips in the perforated skillet. Sprinkle 1/3 of the chicken mixture, black beans, scallions, cheese, and jalapeños on top. Add a second layer of these ingredients, followed by a third. Step 4: Place the nachos in your smoker and smoke until the cheese is melted and bubbling, 15 to 20 minutes. Sprinkle with the fresh cilantro before serving. Variation—smoked nachos on the grill: Your charcoal grill makes excellent smoked nachos. Set it up for indirect grilling and preheat to medium-high (400 degrees). Place the nachos pan on the grate away from the heat and toss the wood chips on the coals. Indirect grill until the cheese is melted and bubbling, 5 to 10 minutes.